Perched on one of Elfin Cove’s tallest hills, Cross Sound Lodge looks out on the small harbor, the town’s boardwalk, fishing boats and shops. It is rich, yet homey at the same time. We like to say it’s the perfect place to spend a week fishing. 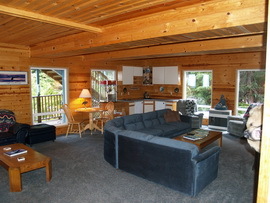 Cross sound Lodge is as comfortable as any place you will find in Elfin Cove. The rooms are spacious, the beds are comfortable and each room has it’s own bathroom and shower. After you return from a day of catching fish you will find your bed made, your room cleaned and any clothes you need washed will be folded and ready for the evening. We go to great lengths to make sure your every need is cared for. Your morning starts with a chef prepared breakfast, followed by snacks and lunch on the water. Return to the lodge for hor d’oeuvres, followed by dinner in our large dining area. 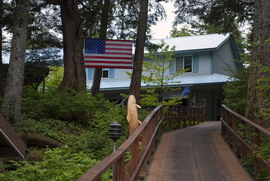 Salmon, halibut, dungeness crab and prime rib are just a taste of what to expect here at Cross Sound Lodge. If that isn’t enough, dinner is always followed by a tasty dessert so be sure to save room.